Prior to founding Saba, Mr. Weinstein was Co-Head of Global Credit Trading at Deutsche Bank. In that role he was responsible for overseeing a group of approximately 650 professionals and was a member of the Global Markets Executive Committee. Throughout his career at Deutsche Bank, Mr. Weinstein had dual responsibility for proprietary trading and market making. In proprietary trading, he founded Saba Principal Strategies to specialize in credit and capital structure investing. As a market-maker, he focused on credit default swaps, investment grade bonds, and high yield bonds. Mr. Weinstein worked at Deutsche Bank for eleven years, the last eight as Managing Director, a title he received at age 27. Mr. Weinstein graduated from the University of Michigan, Ann Arbor, with a BA in Philosophy. 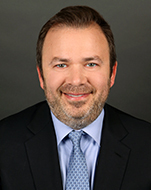 Mr. Weinstein grew up in New York City and attended Stuyvesant High School, where he is currently on the Board of Directors. Mr. Weinstein is also a Leadership Council member for Robin Hood, New York's largest poverty-fighting organization.